For football loving kids our parties are the ideal Birthday celebration. Our children's Birthday parties include an hour of action on the 5 a-side pitch with a warm-up, fun games, skills and match play. The party then moves inside for Birthday tea with your choice of hot food (pizza or chicken nuggets) or sandwiches. We will send you a party invite that you can send to your guests and the Birthday boy or girl will get a a special gift from us. Parties are available on Saturday and Sunday 12.30-2pm. Our party prices are for up to 16 guests. If you have more than 16 or fewer than 12 guests just give us a call to discuss. 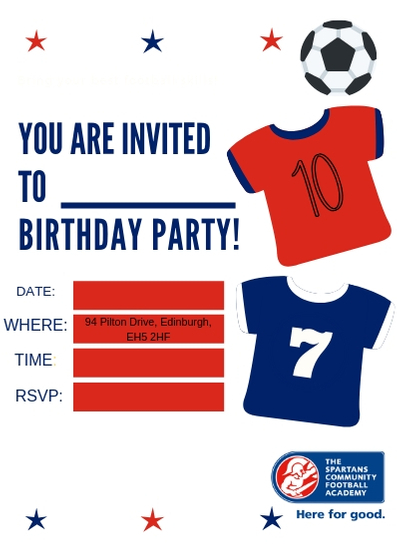 Spartans' Party £155: 60mins of football fun with a qualified coach and Birthday tea. Spartans' Team Experience £195: 60mins of football fun with a qualified coach followed by Birthday tea. You will then tour the first team changing room and your party will guide the first team out onto the pitch for their game. This party is available subject to first team home fixtures. To book your birthday party at The Academy, please call 0131 552 7854 and ask for Kerr Allan who will be happy to help.